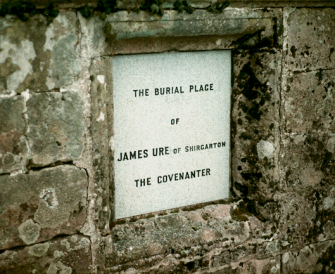 James Ure came from Shirgarton, or Shar-garton as some books spell it, in Stirlingshire. He was an Episcopalian minister, but left that faith to follow Presbyterianism. From 1670 he led the life of a dissenter, and had his children baptised by outed ministers. He had to spend some time incognito in Ireland for a time, but returned to Scotland. We were not concerned with an enemy, as if there had not been one within a thousand miles of us. There were none went through the army, to see if we wanted powder and ball. 1 do really think there were few or none that has both powder and ball, to shoot twice.... The Lord took both courage and wisdom from us. Alexander Smellie relates that Ure did his best in the battle, but to no avail. He and Hackston held the bridge for some time, but were defeated by the better-organized troops. James Ure managed to make an escape from the battlefíeld. He returned to the Campsie Hills where he remained in concealment for nine years. One of his favourite hideaways was the wood of Balquhan (perhaps Boquhan, near Kippen) where he often woke in the morning to find his clothes frozen to the ground. It is recorded that Ure spent only three nights in his house over a period of nine years. On the 9th January 1682 Ure was put on trial for his political crimes, as well as "throwing off the fear of God." He was forfeited of his estate, which the soldiers robbed. Ure's seventy-year old mother was arrested at a conventicle held at Gribloch, on Kippen Muir, and transported south to Glasgow's Tolbooth. She died of her sufferings there. A reward of £100 was made in the hope that some folk would reveal the hiding place of Ure, but none came forward. Ure's wife, who had a young child, was taken forcibly to Stirling and thence to the Canongate Tolbooth. She was released after four weeks imprisonment, however. At the Revolution Ure came out from hiding. He was able to get a commission in Argyl's regiment. His forfeiture was later rescinded by Parliament. Ure survived for many years thereafter, living until at least 1746. When he died he was buried in the old kirkyard of Kippen, Stirlingshire.